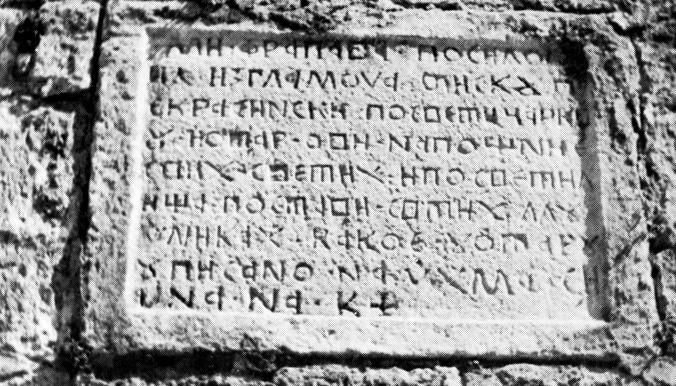 The tradition of the Croatian Cyrillic Script goes back to the 12th century and lasted continuously until the 18th century, with sporadic uses even in the 20th century. 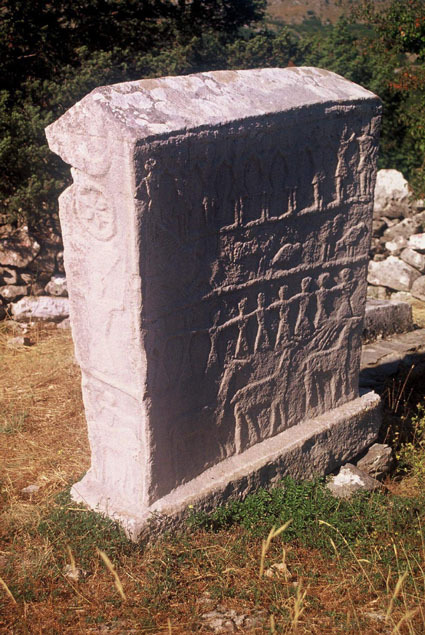 Of course, there are incomparably more Croatian Glagolitic monuments than Cyrillic, not to speak about tremendous Croatian literature in the Latin Script since the 15th century. 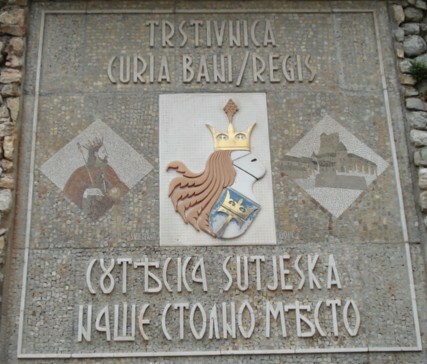 However, it is the fact that the Croatian Cyrillic represents an important cultural heritage. 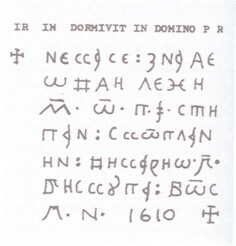 This Script was in use among the Croats in Dalmatia (especially in the Split and Makarska hinterland), in the Dubrovnik region and in Bosnia-Herzegovina. 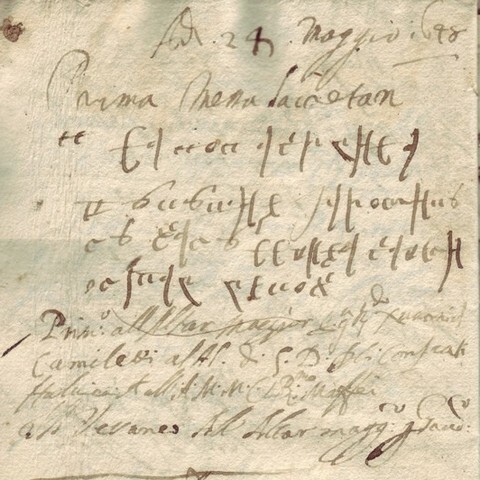 It is interesting that some of the Croatian Catholics, who visited the Vatican in the 17th and 18th century, left their signatures written in the Croatian Cyrillic, which they call expressly the Croatian script. the region of Dubrovnik, including Konavle. The name of `Bosančica' (or `bosanica') is of a relatively recent provenance - it has been created by a Croat Ciro Truhelka in 1889, at that time a very young, 24 years old scientist. Its rather misleading name suggests that it has been related exclusively to the territory of Bosnia, which is not true, since it was used in Herzegovina, Dalmatia and on some Croatian islands as well. It is interesting that Croatian Cyrillic, i.e. 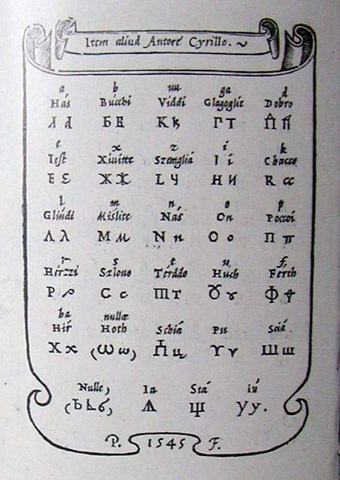 `Bosancica', can be seen in Croatian texts written in Istria, see below. The name of `western Cyrillic', which also appears in the literature, is even more imprecise (`western' with respect to what?). 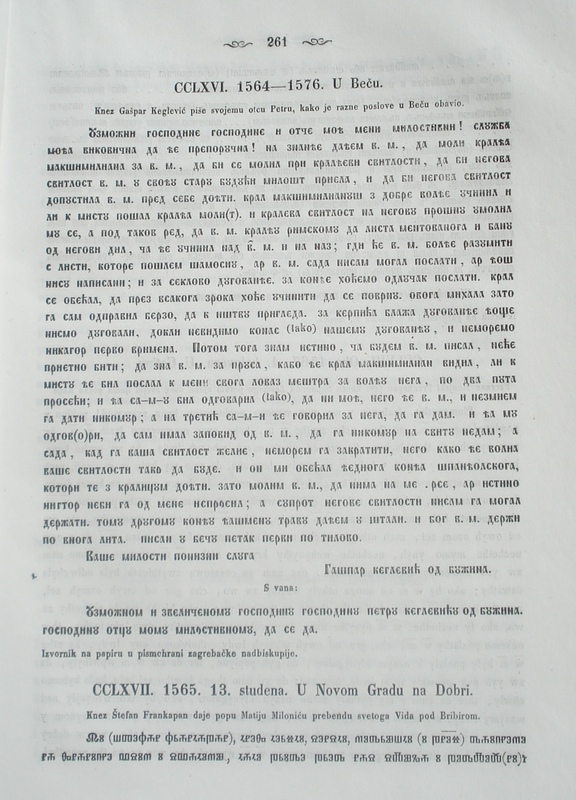 It seems to be appropriate to call this version of the Cyrillic script by the national name of those who used it most and who left the greatest number of written documents, as in the case of other national versions (Bulgarian Cyrillic, Macedonian, Montenegrin, Serbian, Ukrainian, Byelorussian, Russian). There are also important palaeographic reasons, see [Benedikta Zelic-Bucan]. Thus the notions of Croatian Cyrillic and "Bosancica" are equivalent. 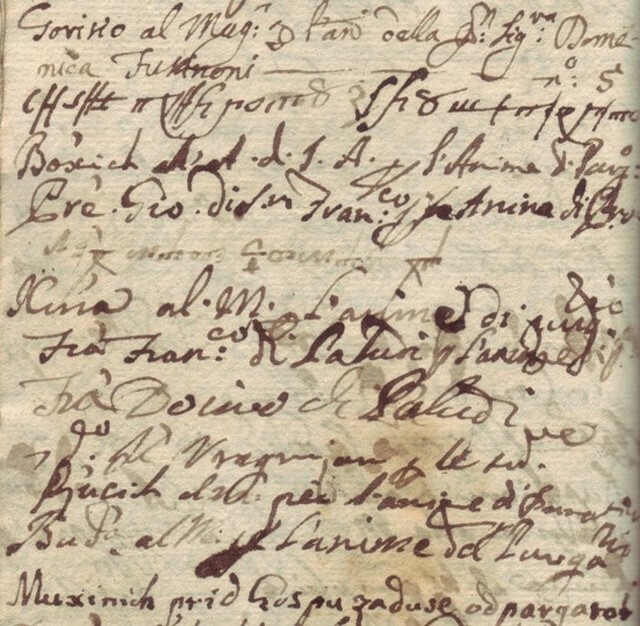 A short note about Croatian Glagolitic and Cyrillic can be found in Viaggio in Dalmazia by Alberto Fortis, Venice 1774. 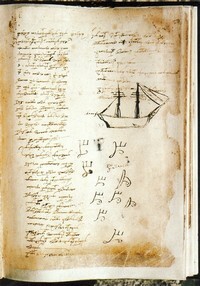 The book is also known to have brought the famous poem of Asanaginica to European public. Vatroslav Jagić (19th century, Tomislav Raukar (mid 20th century, Zagreb): "Western Cyrillic" (western with respect to what??). 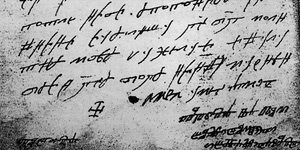 Jagić also used the name of "Bosnian - Dalmatian Cyrillic." An important and highly readable book treating the three-script history of Croatian Middle Ages (including Croatian Cyrillic) is [Hercigonja], written by outstanding specialist in 1994. It should be consulted by anybody wishing to study in more detail extremely complex history of writing among the Croats. Al su snizi al so labutove? 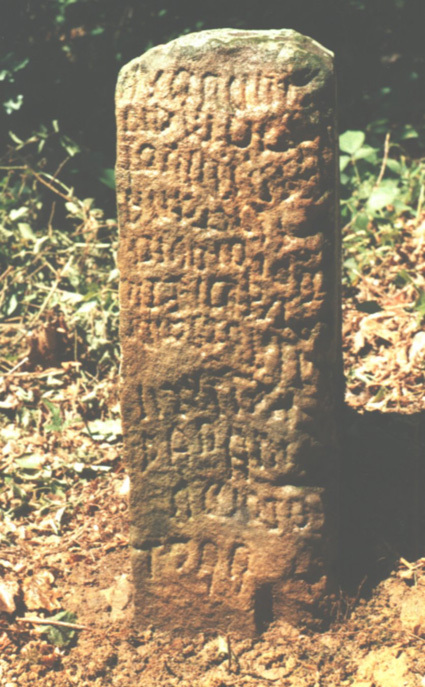 The inscription of pop Tjehodrag, 12th century, Livno, Bosnia and Herzegovina, discovered in 2003, described in [Marić, Šimić, Škegro]. Photo below by the courtesy of Slavko Kirin. 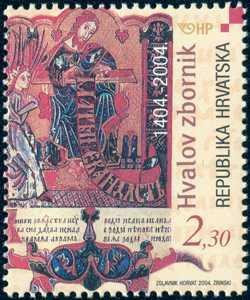 The Evangel of Prince Miroslav of Zahumlje (dating from the end of the 12th century), created by Croatian Benedictins, most probably in the city of Ston on the Peljesac peninsula. 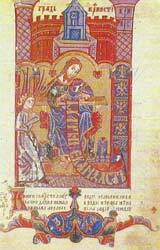 It has been noticed already in the middle of the twentieth century that miniatures of this evangelistary do not belong to the Byzantine style, but to the Roman (western) style (Ivan Ostojic in his voluminous three-volume "History of Benedictins in Croatia"). 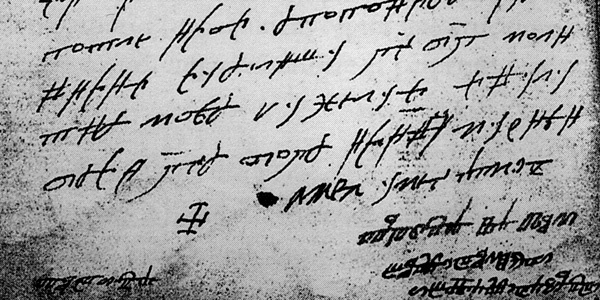 The language analysis performed by Benedikta Zelić-Bučan, based on the previous investigations of a Croatian palaeographer Josip Vrana, shows that it has been written in the Croatian recension of the Church Slavonic language. This important monument is held in Belgrade (Narodni muzej), except of one page which is in St. Petersburg. 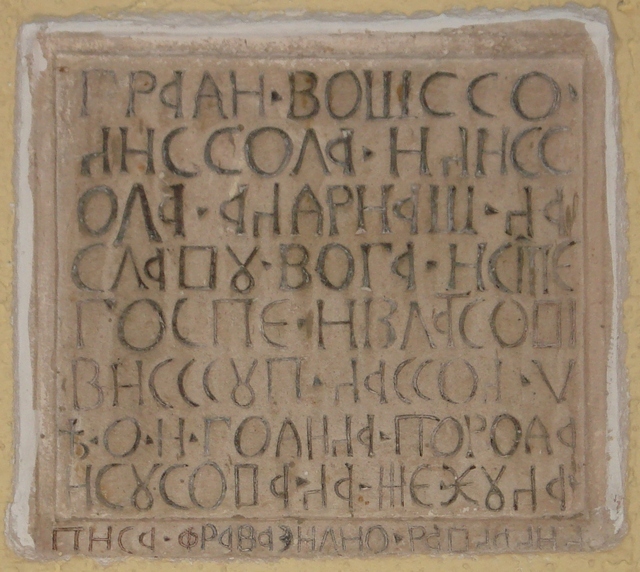 the Trebinje inscription of the župan Grdo from Trebinje in Herzegovina (second half of the 12th century). "Zupan" (country prefect). This very old title is in use in Croatia even today. 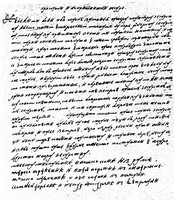 the Croatian Chronicle (12th-14th centuries); the famous Croatian humanist Marko Marulić translated it from Croatian Cyrillic into Latin in 1510. 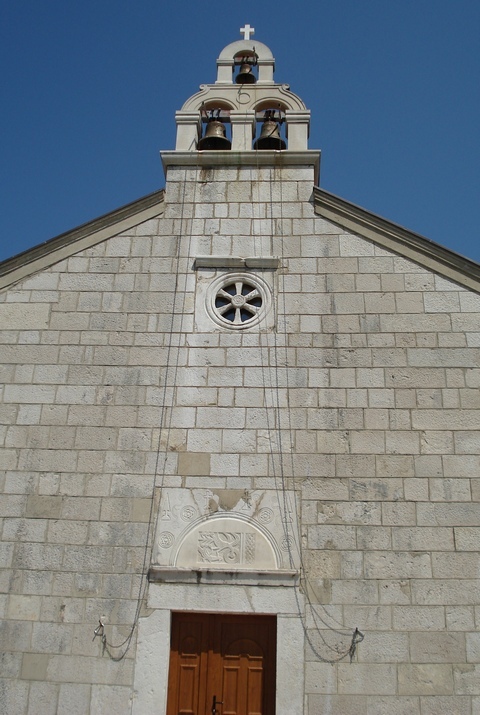 The chronicle was written by Archbishop Grgur of Bar (pop Dukljanin). 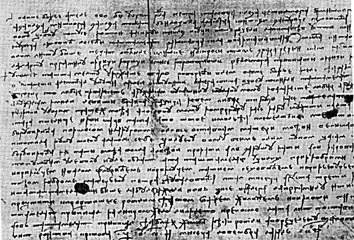 Here we provide a translitartion of the Charter of Ban Kulin, August 28, 1189, from Croatian Cyrillic to Latin script, with English translationn provided by Mr. Marko Puljic, USA. 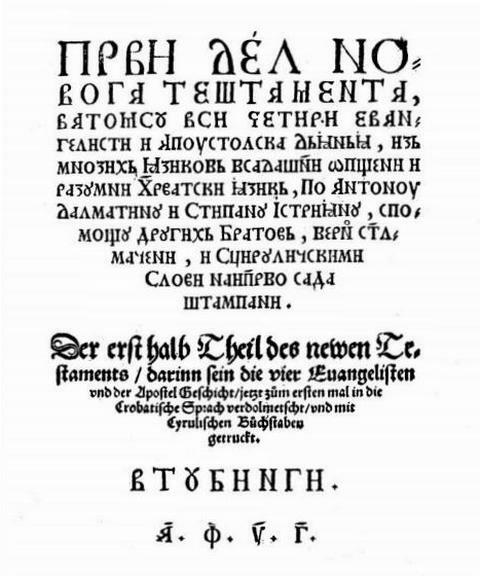 Note the solemn Christian invocation "In the name of Father and of the Son and of the Holy Spirit" (and other), a proof that Bosnia at that time was a Christain land. I, Kulin, ban of Bosnia, swear to be a true friend to you, o prince Kr’vash, and to all Dubrovnik citizens from now on and forever, and to keep true peace with you, and true faith, as long as I am alive. All Dubrovnik people who go through my domain trading, wherever anyone wants to move or wherever anyone passes, I will in true faith and with a true heart keep without any damage, unless someone of his own will gives me a gift, and let there be no violence against them by my officers, and as long as they are in my lands I will give them advice and help as I would to myself, as much as I am able, without any evil intention. So help me God and this holy Gospel. 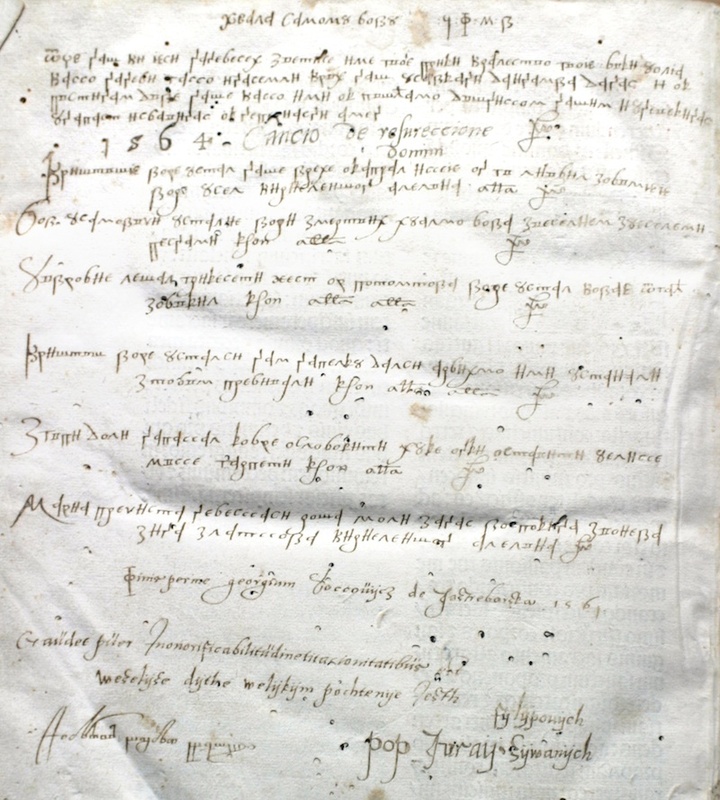 I Radoje the ban’s clerk wrote this document by the command of the ban, one thousand and one hundred and eighty and nine years from the birth of Christ, the month of August, the twenty-ninth day, [the day of] the beheading of John the Baptist. 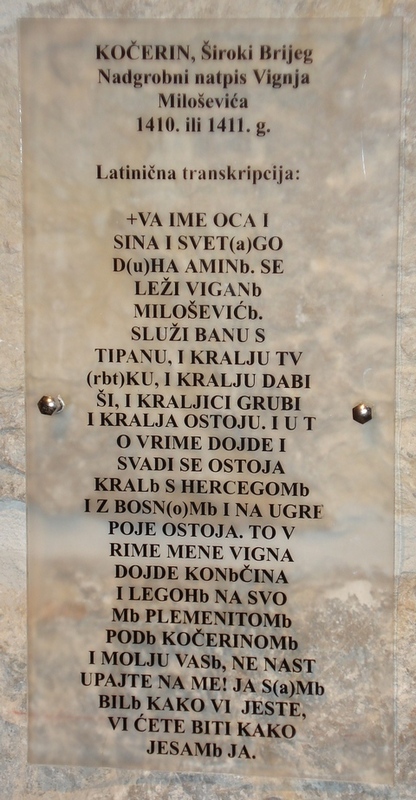 It is interesting that in 2012 a monument dedicated to Ban Kulin was errected in the city of Tuzla in Bosnia and Herzegovina, containing this text, but with indicated boldface parts deleted, obviously aiming to deny the Christian roots of Ban Kulin. For more information see here. 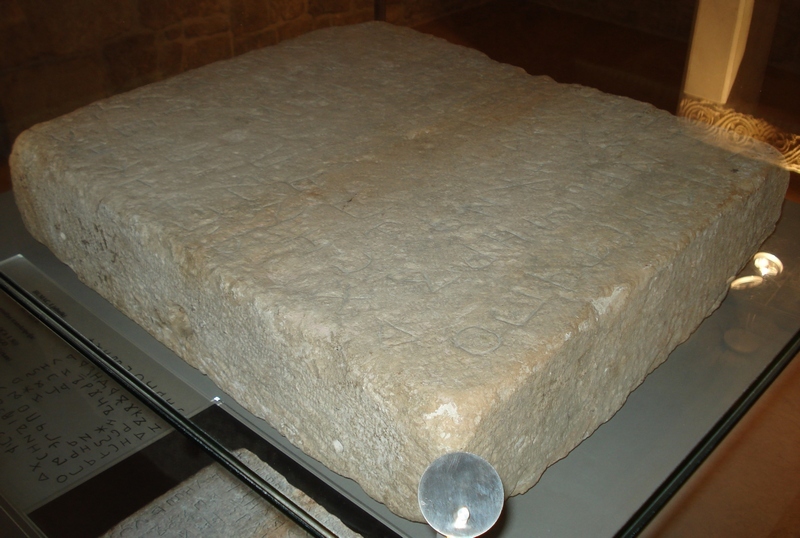 Humac Tablet (Humačka ploča), kept in the Franciscan Museum in Ljubiški, BiH. 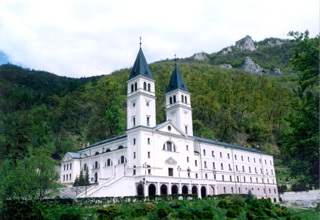 According to academician Eduard Hercigonja, it dates from 11th century. u ime Gospodina Boga - amen. 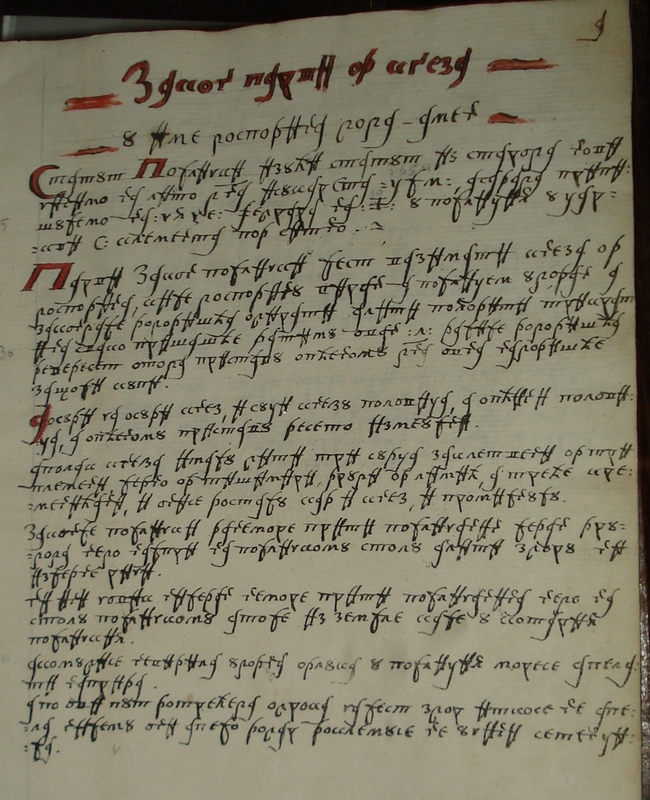 The Poljica statute, a famous Croatian Cyrillic legal document. 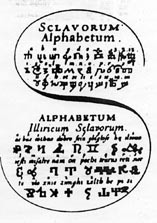 This is a version from 1665, kept in the National and University Library in Zagreb. 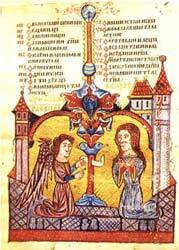 The oldest preserved version is from 1440., and it is known to have been based on even older manuscripts. (on the left: + V ime Bozje, se lezi Radovan Pribilovic, na svojoj zemlji plemenitoj, na Ricici; bih s bratom se razmenio, i ubi me Milko Bozinic, sa svojom bratijom; a brata mi isikose i ucnise vrhu mene krv nezaimitnu vrhu; Nek (zna) tko je moj mili. 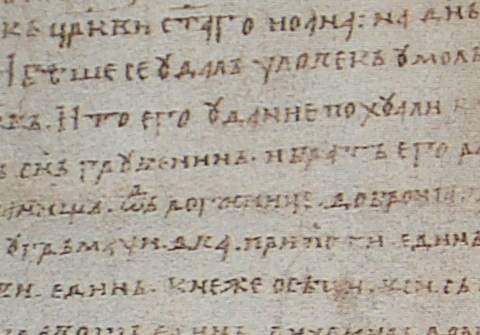 Numerous manuscripts show the parallel use of the Croatian Glagolitic and Cyrillic Scripts (and also the Latin Script), thus proving that they were not opposed to each other among the Croats. 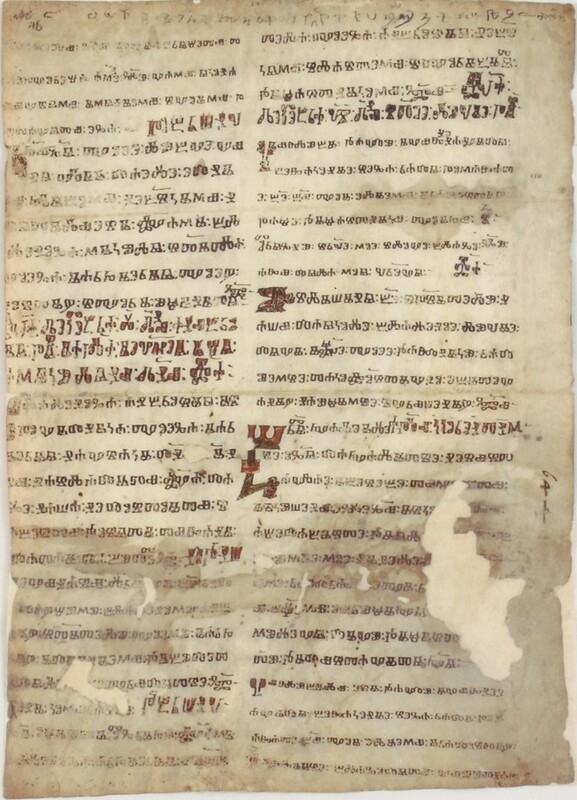 One of the oldest such examples originates from Istria (St. Peter in the Wood, 12th century), where in one single word - Amen - all three Scripts are used! 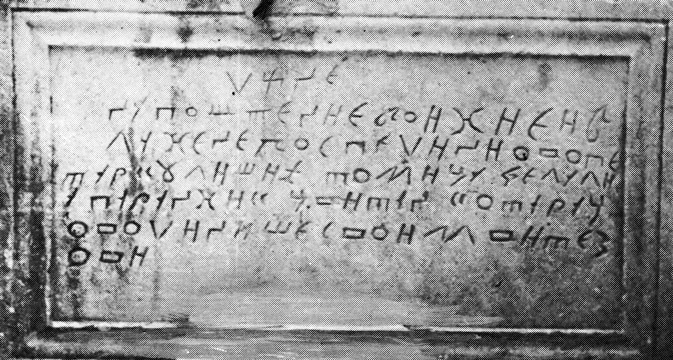 The coexistence and parallel use of these three Scripts - Croatian Glagolitic, Cyrillic and Latin - is a unique phenomenon in the history of European culture. 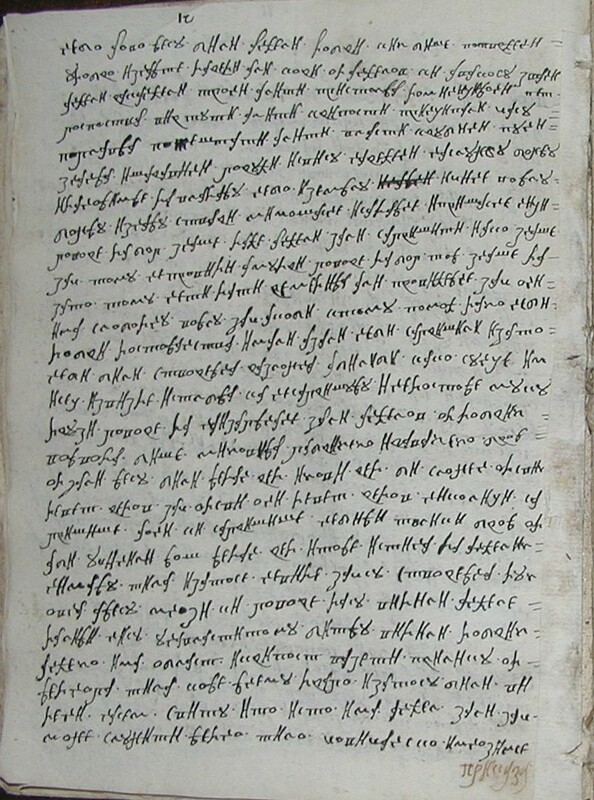 the Manuscript of Krstyanin Radosav, 15th century (which contains three Glagolitic notes), kept in the Library of De Propaganda Fide in Rome, etc. 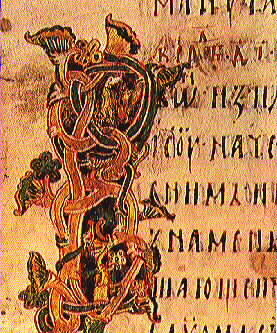 are based on Croatian Glagolitic Church books. For more information about Bosnian Krstyans see [Leon Petrovic]. 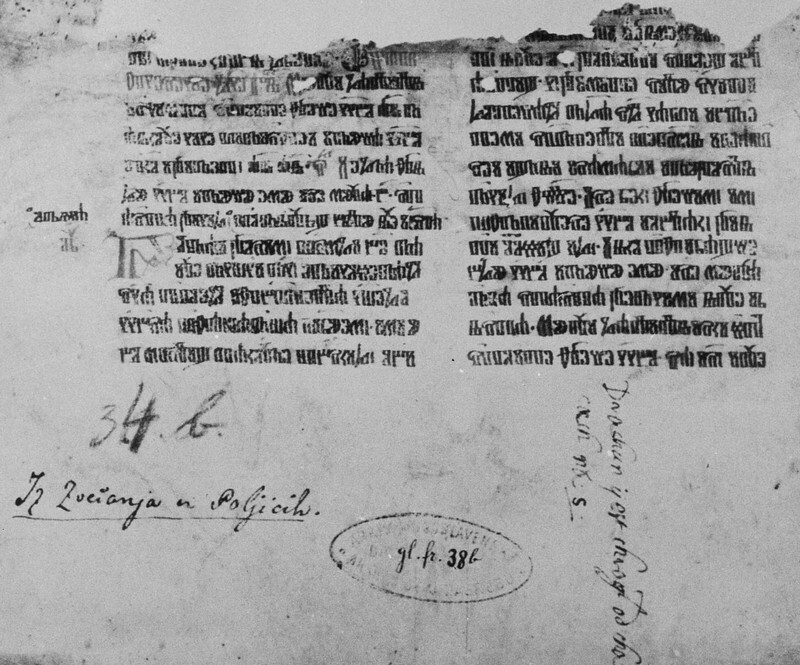 The first printed Croatian Cyrillic book was The Book of Hours (or the Dubrovnik breviary, or Oficje) published in Venice in 1512, prepared by Franjo Ratkovic from Dubrovnik. One copy is held in Paris in Biblioth�que Nationale. 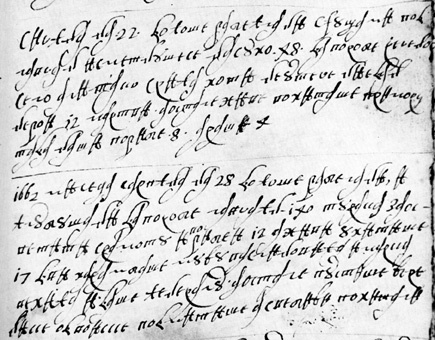 There is also another copy in the Codrington Library at All Souls College, Oxford (q.14.9); it was probably part of the founding bequest of Christopher Codrington in 1710. It is, admittedly, slightly less complete than the Paris copy, lacking 19 leaves. Many thanks to prof. Ralph Cleminson (University of Portsmouth, UK) for information about the Oxford copy. 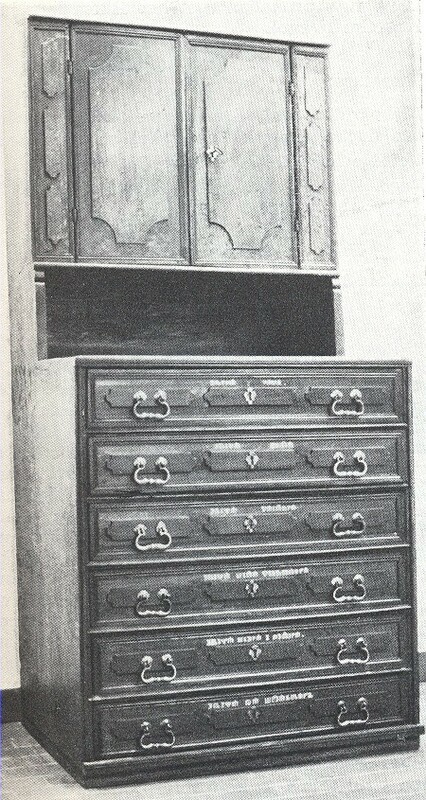 The third preserved copy is kept in Washington. 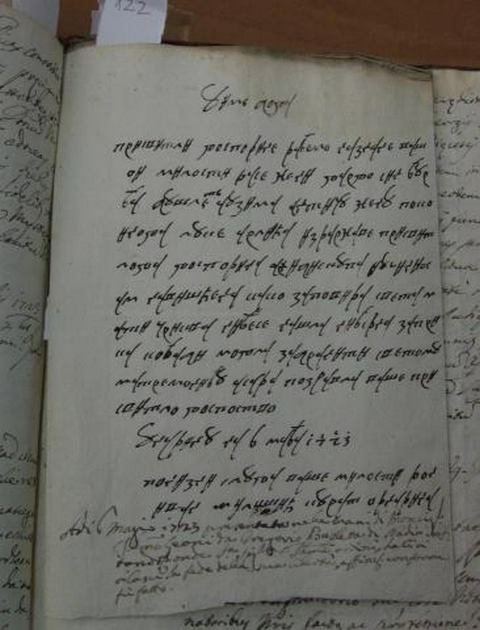 In 2012 an international conference "Croatian Cyrillic Heritage" (Hrvatska ćirilična baština) has been organized by Croatian Academy of Sciences and Arts, on the occasion of 500 years since the first printed Croatian Cyrillic book. The book of summaries of lectures: [PDF]. Proceedings from the conference will be published. 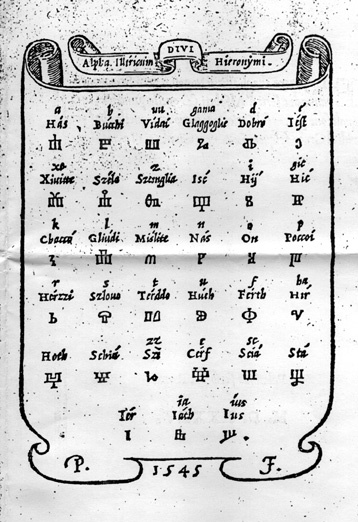 among all Cyrillic scripts only Croatian Cyrillic has the numerical value for CH (i.e. 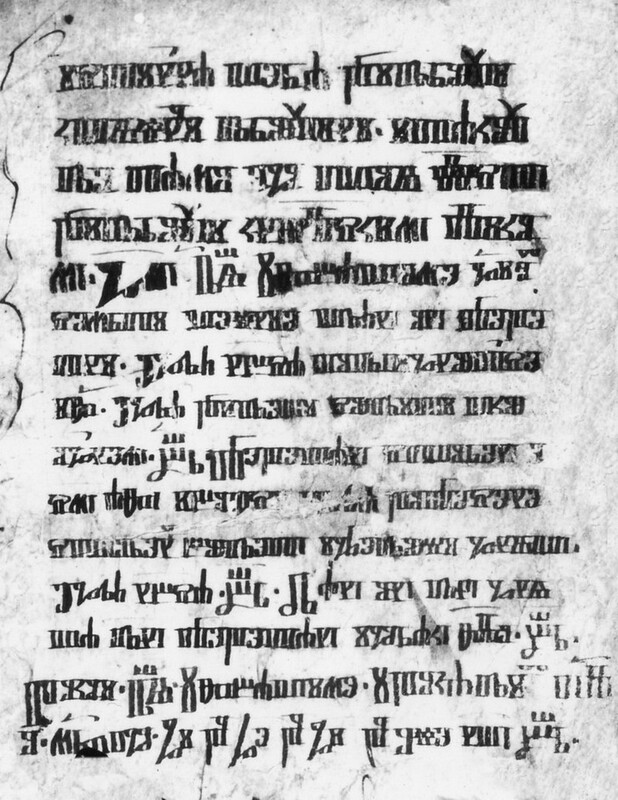 for chrv) equal to 1000, the same as in the Glagolitic script (see Grubisic's monograph, p. 116). 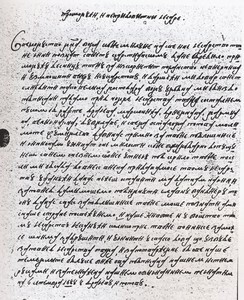 the Croatian Cyrillic legal document written in the city of Makarska (on the Croatian littoral) in 18th century. Mahmud b. Salih, captain of Ostrovitsa and Bihach provinces. 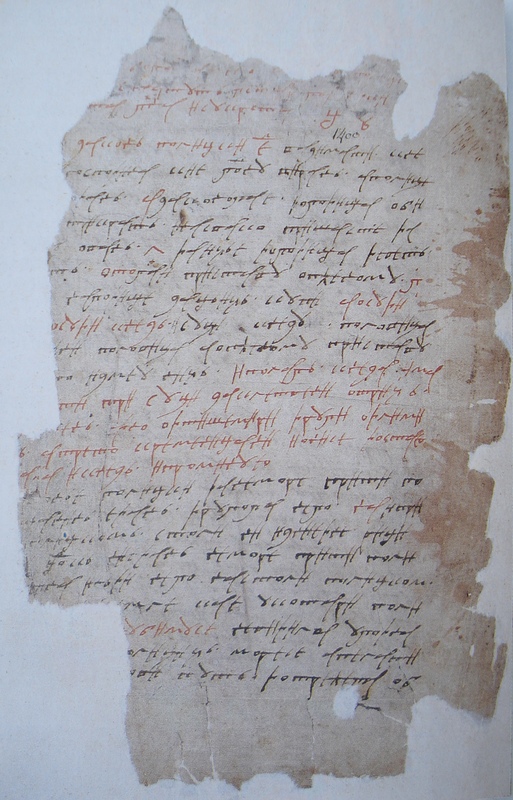 Letter to Pavasovich, serdar of Shibenik and Skradin kapitenias (provinces in Croatia [Šibenik and Skradin are Croatian towns on the Adriatic Sea; D.Ž.). 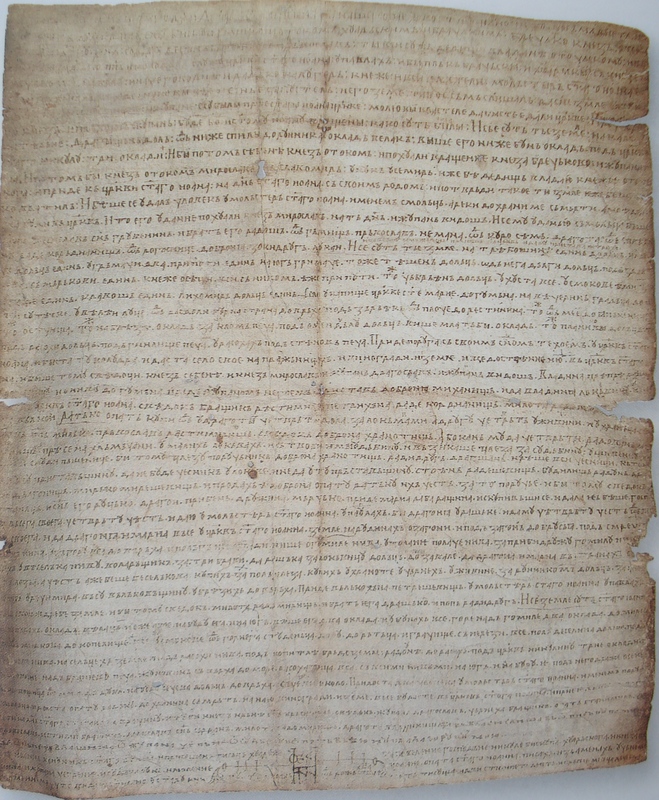 1135 A.H./1722 – 1723 A.D. 1 f., 305 x 209 mm, paper. Coll. 67. Berchich. No. 62. 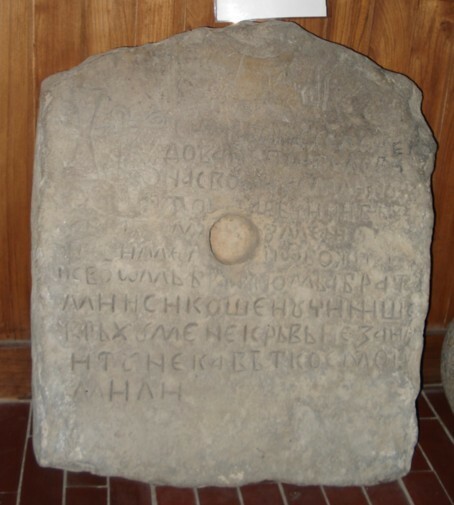 See a stone fragment (1640) from Modrus in Lika, inscribed with letters in Cyrillic and Latin script. 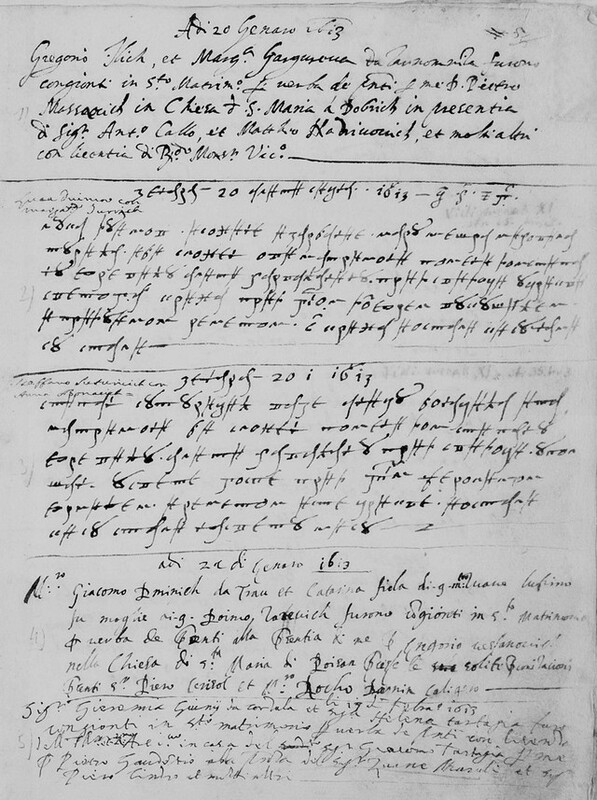 The first sentence reads (Prva rečenica glasi): Izveličeni i zmožna gospodo, bani Hrvacki! 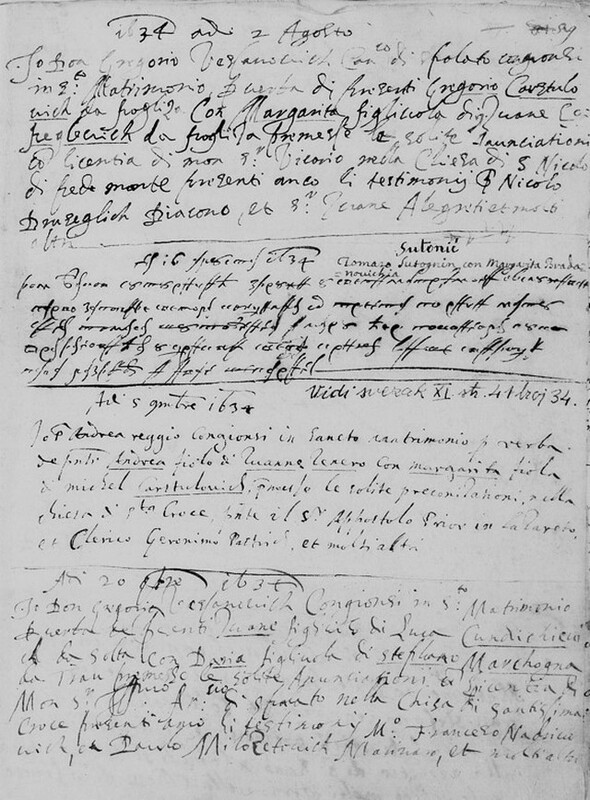 See Acta croatica, p 243. 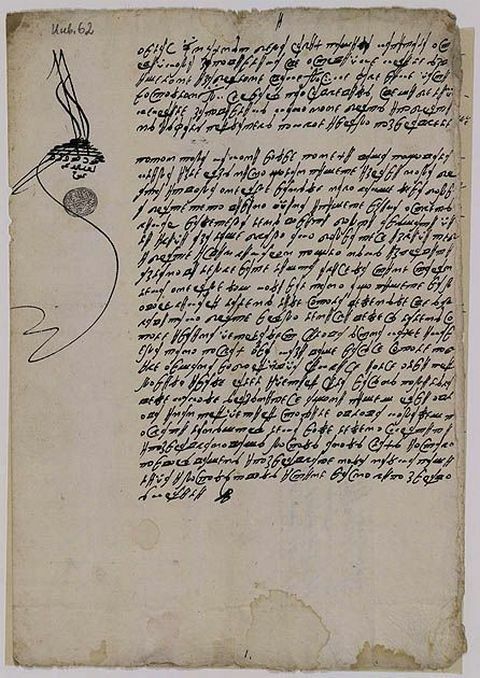 Godine 1552. tijekom ispitivanja svjedoka u vezi parnice kneza Nikole Zrinjskoga s knezom Petrom Keglevićem poradi Selca, u dokumentu pisanom hrvatskom ćirilicom, spominje se kao jedan od svjedoka Varban Harvatić. Vidi Acta croatica, str. 252. 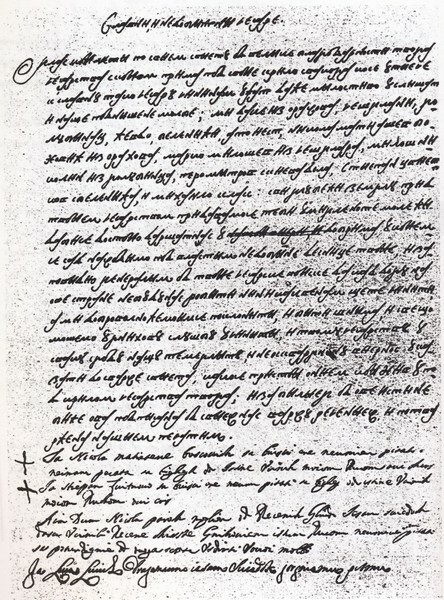 Klimpuch text from 1561. Photo by the courtesy of Dr. Katharina Tyran, Austria. 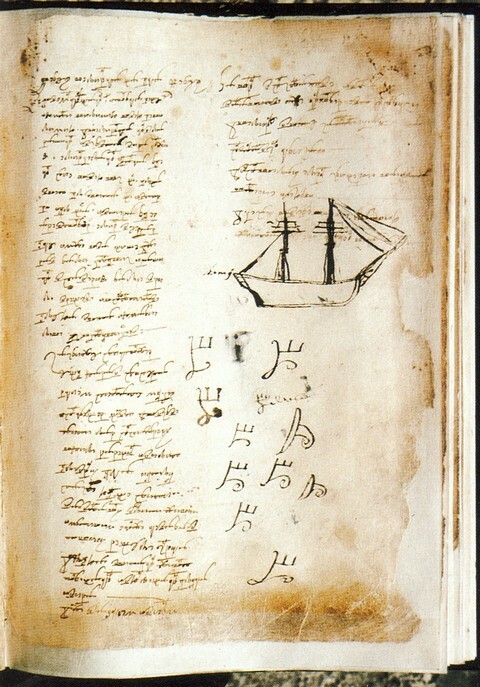 See also an article by Alojz Jembrih: Hrvatski zapis (1564.) 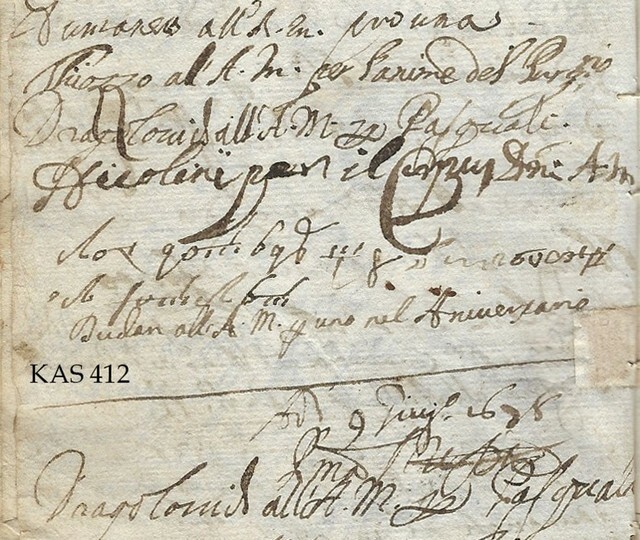 Jurja Vukovića iz Jastrebarskoga u latinskom misalu župe Klimpuh [PDF], Kroatologija 2(2011)2: 44–67, where a somewhat different transcription is provided. 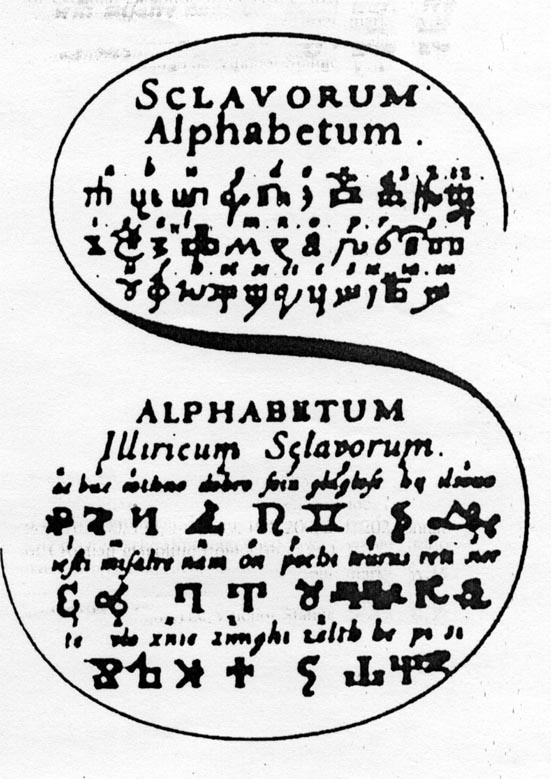 The books were printed in Konzul’s and Dalmatin’s Croatian-Urach Cyrillic script, see Alojz Jembrih [PDF1], [PDF2]. 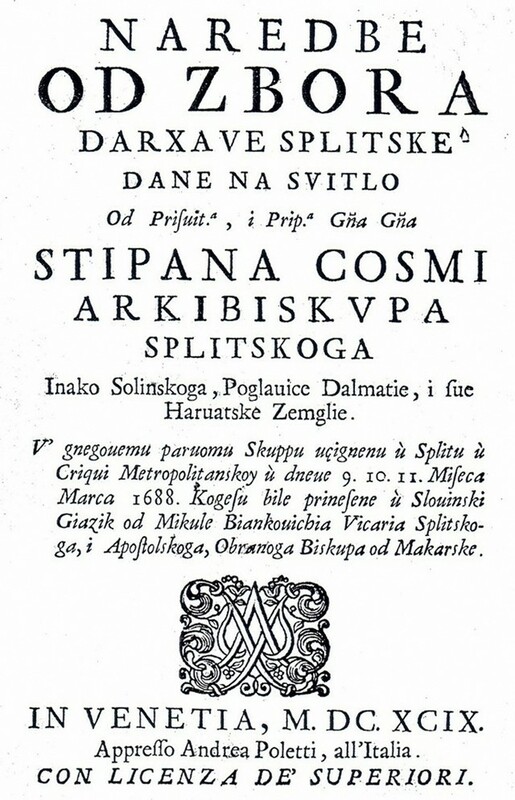 The whole edition was prepared by Anton Dalmatin and Stipan Istrian, as well as by other brethern. 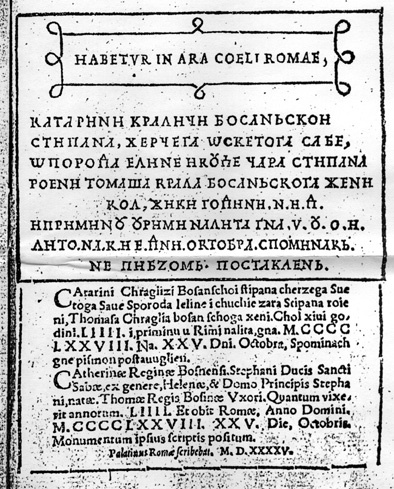 The same book was published in Croatian Glagolitic Script in 1562/63, prepared by the same persons. Reprints of these books have been published in 2008 by the Theological Faculty "Matija Vlačić Ilirik" in Zagreb, where you can find more information. You can listen to the text, narrated by Stjepan Bahert, drama artist: Glagoljski zapis don Bare Pifrovica iz okolice Zadra. 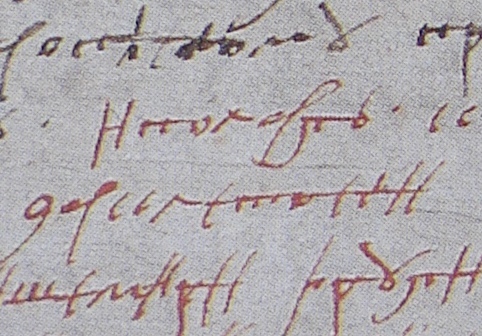 In 1636. 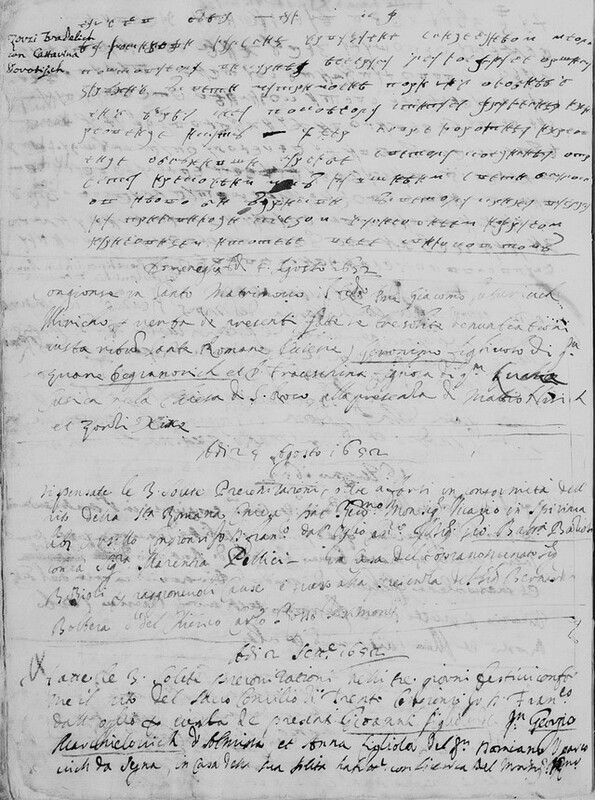 Croatian glagolitic priest Bare Piforovic wrote in the Registry of Dead from the parish of Petrcane near the city of Zadar the following lines in the Croatian Cyrillic: "Ja, dom Bare Pifrovic, to pisah krvaski, curilicu i latinski..." (Me, don Bare Pifrovic, wrote this lines in Croatian, in Cyrillic and Latin...). See [Hercigonja, Glagoljaštvo i glagoljica]. 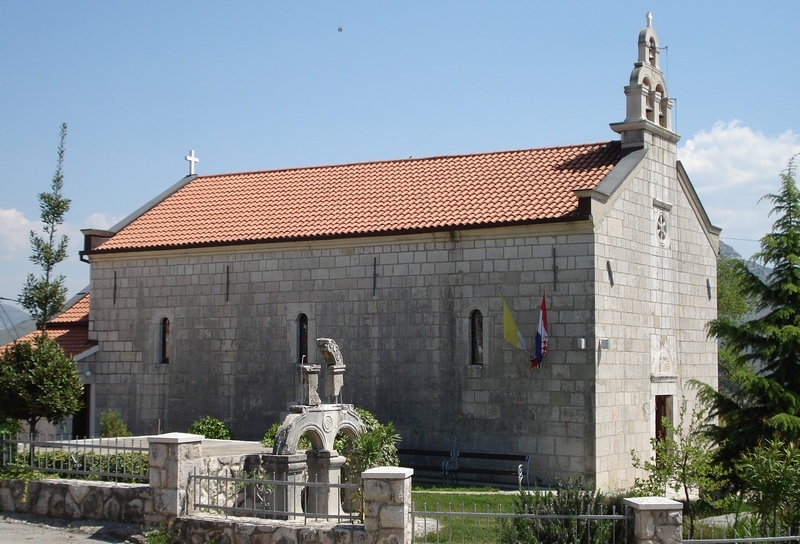 Parish church in the village of Ravno in 2007, damaged in 1991 when the Greater Serbain agression on BiH started. 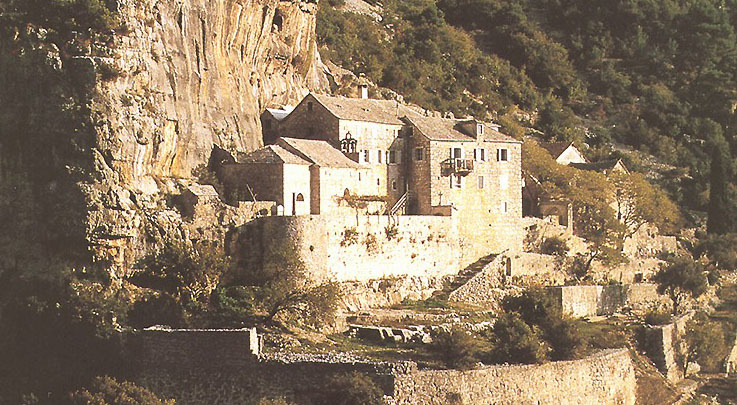 Village of Ravno, Eastern Herzegovina, not far from Dubrovnik. 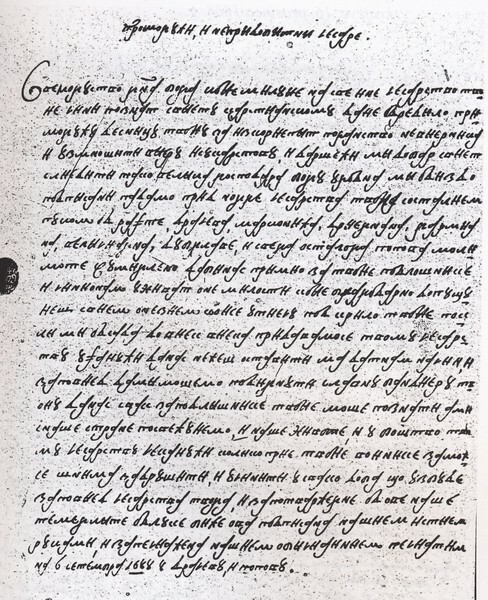 A Croatian Cyrillic text written by inhabitants from Ravno, Dracevo, Drijenjan, Grmljan, Velican, Dubljani and other parts of Popovo, written 1688, admitting Leopold I as their protector. See [Dubljani, p. 91]. 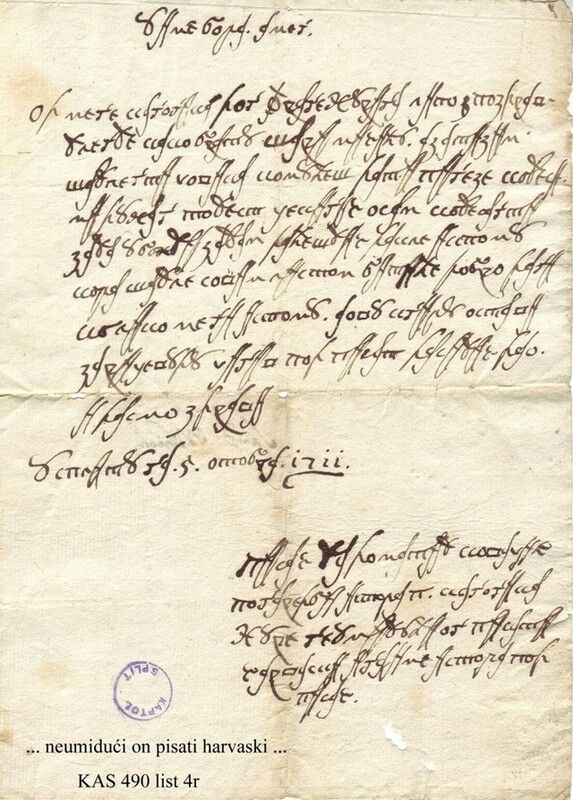 sending letter to emperor Leopold I asking him for protection in 1688. See [Dubljani, p. 92]. six on the island of Brač: except the mentioned convents of Blaca, Dračeva Luka and Zmajeva špilja (Dragon's Cave), also Dutić, Silvio i Stipančić (near the village of Murvice by the famous Zlatni rat). 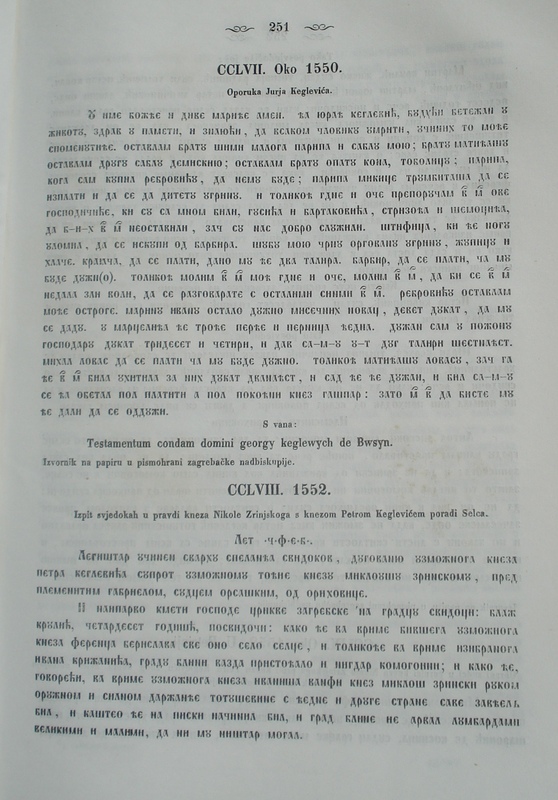 The following book issued by the Croatian Academy of Sciences and Arts deals with medical recepies texts from the 18th century written in Croatian Cyrillic Script in the region of Poljica near the city of Split. 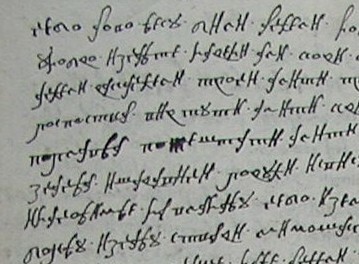 Some Croatian nobleman and a part of aristocracy used among others Croatian Cyrillic Script: these refer to families of Frankapan, Keglević (on Croatian north! ), Peranski, Kačić, Petar Kružić, Nikola Jurišić, etc. 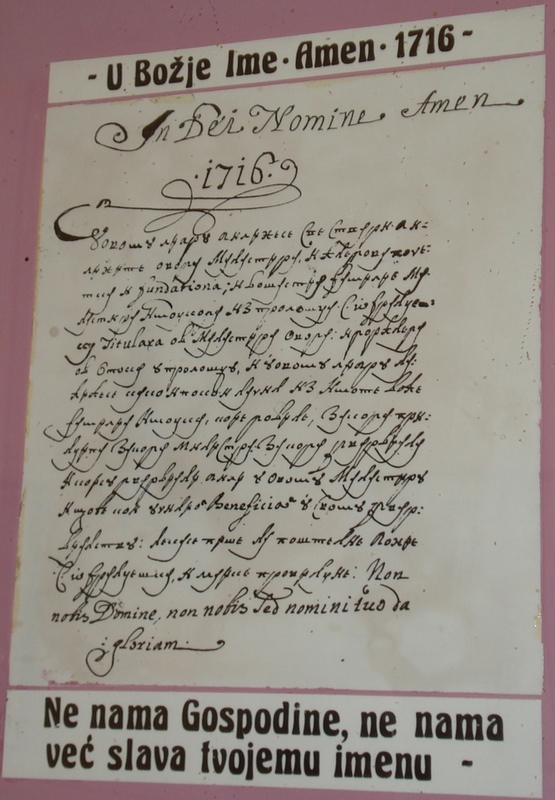 Museum of the town of Grude (BiH), Chronicle of fra Stjepan Vrljić from 1716, written in Croatian Cyrillic. The first and the last sentences are the Latin Language. In Dei Nomine Amen. ... Non nobis Domine, non nobis sed nomini tuo ad gloriam. Prisvitli gospodine daemo na znane vašoi milosti da se ženi Gargo sin Jurja Bušlete a uzima Anticu ženu pokoinoga Luke Arlića iz daržave prisvitloga gospodina arhibiskupa i ucinil san navišćenja kako zapovida sveta mati crikva i nije se našla nijedna zaprika koja bi mogla zabraniti svetomu matremoniju a sada pozdravla vaše prisvitlo gospodstvo. We owe our gratitude to Mr. Ivica Glavan, University of Zadar, for sending us this interesting document. 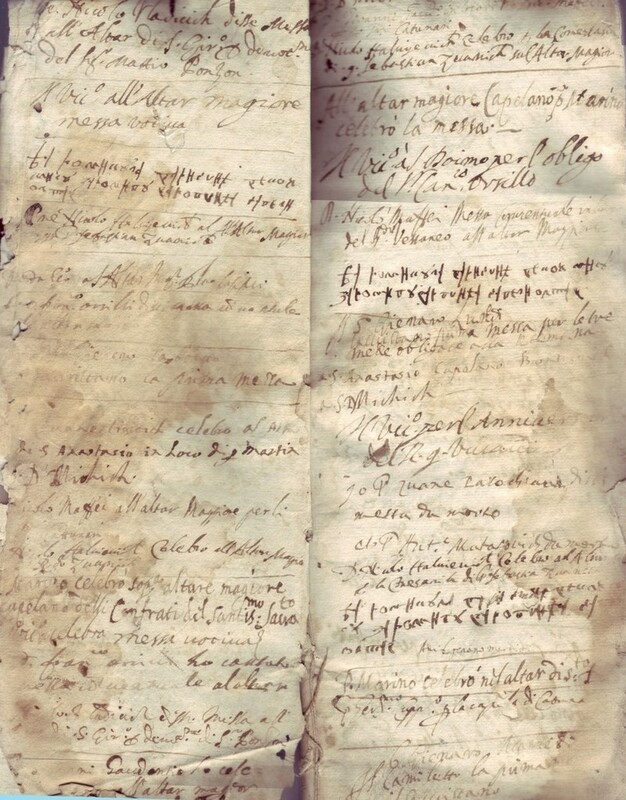 In 2014, a monumental monograph [Kujundzic] has been published about a little known and very importyant Croatian medical book, dating from the mid 18th century. 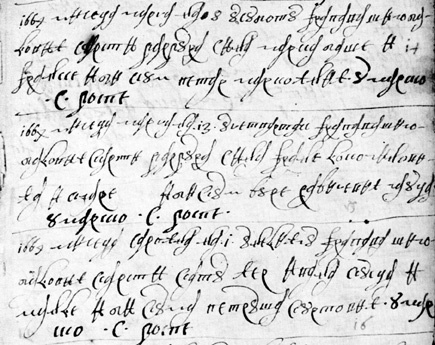 It contains as many as 1700 medical recepies, writen in Croatian Cyrilic Script (poljičica). 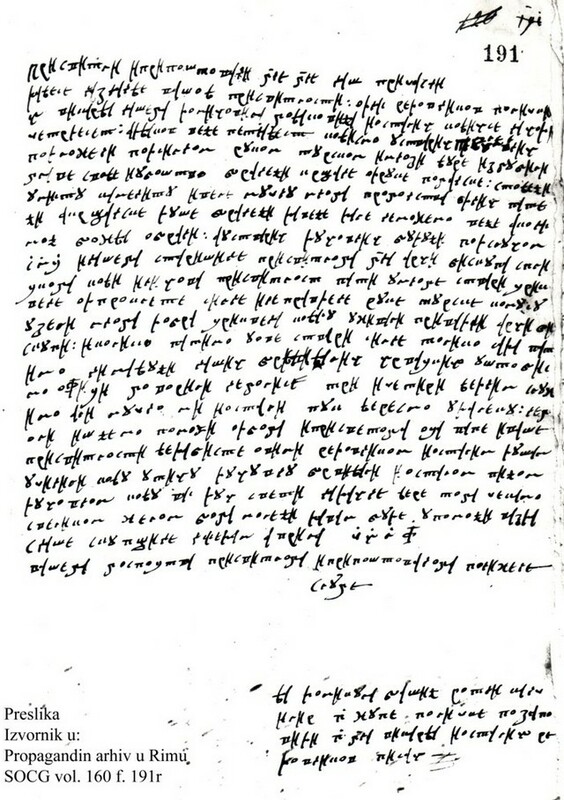 While the original text contains 406 readable pages, the scholarly study was published in 2014 on 756 pp. 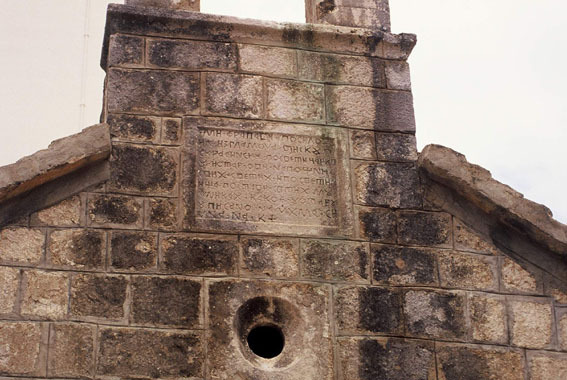 This extensive and important monument of Croatian language and culture dates from about 1750, and originates probably from the region of Poljica, that is, from the region between Split and Omiš, arround the mountain of Mosor. 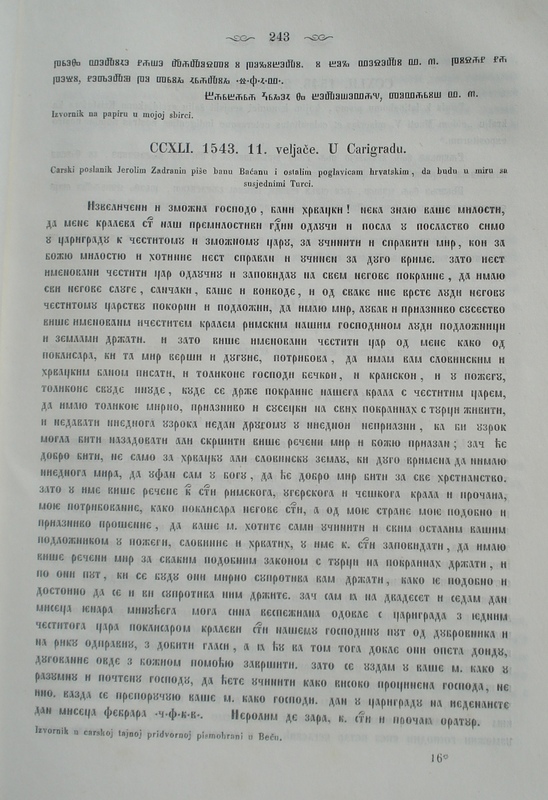 The language of the text is close to contemporary Croatian štokavian, based on older čakavian Croatian speech. The vocabulary is ikavian: misec (mjesec - moon), bilo (bijelo - white), mliko (mlijeko - milk), liči (liječi - cure), imišaj (izmješaj - mix), cviće (cvijeće - flowers), slip (slijep - blind), vitar (vjetar - wind), medvid (medvjed - bear), odića (odjeća - clothing), svića (svijeća - candle), etc. Sources of some of the recepies are explicitly mentioned. 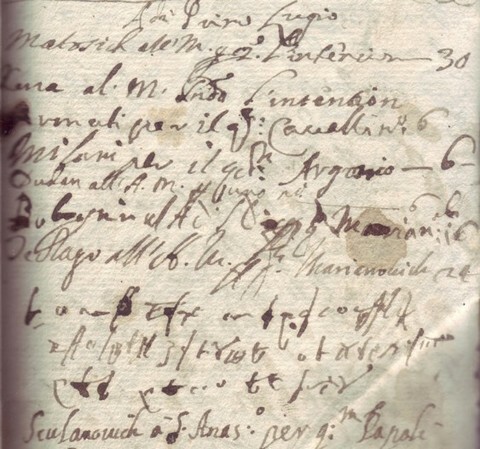 For example, the name of distingushed Catalonian scholar Arnaldus de Villanova is mentioned in the book as Rinalod s Novog Sela (in the recepy no. 912). The name of Plinius is mentioned in 35 recepies, of Dioskurid in 25, while the name of Plato is mentioned in 17 recepies. 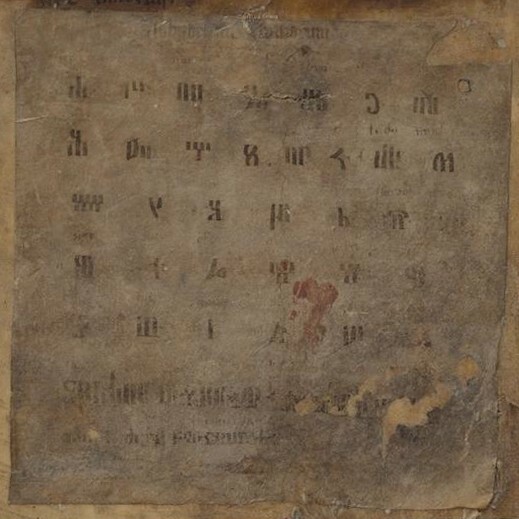 The book has been discovered in 1920/21 in the village of Budimir near Trilj dating from around 1750, and is probably a copy of an even older book. Rev. 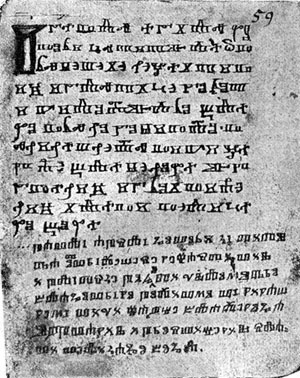 Dr. Slavko Kovačić, professor of Theology at the University of Split, distinguished church historian, supplied us with the following very interesting information concerning the Croatian Cyrillic script. 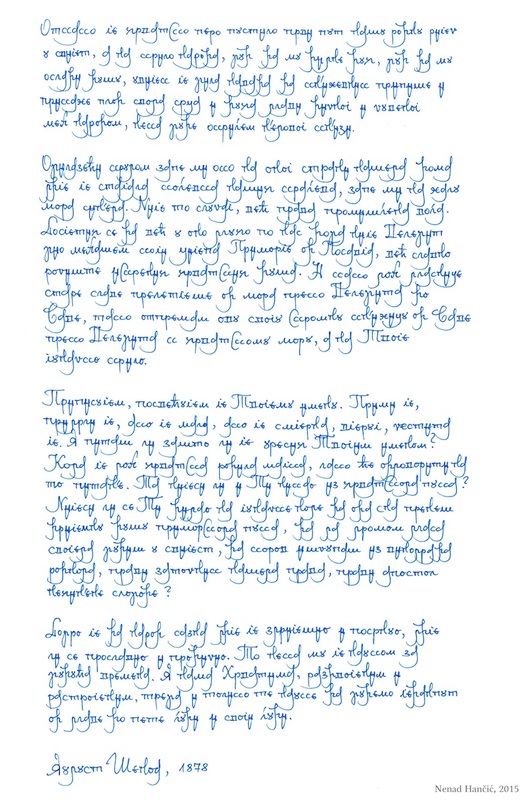 We express our gratitude for his permition to use the data and photos (exhibited in this section) from his lecture delivered in Zagreb in 2017, organized by the Society of Lovers of the Glagolitic Script (Scripturae Glagoliticae Amicorum Societas). 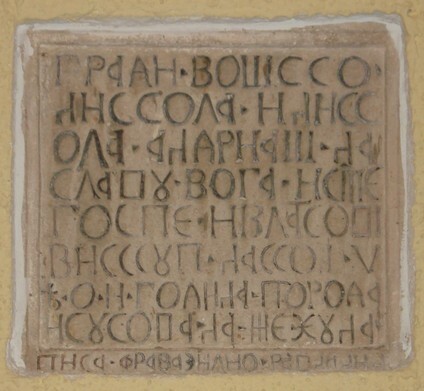 There are numerous preserved documents, written in Croatian Glatolic and Cyrillic, proving that the Glagolitic mass was served even in the Split Cathedral. U Splitu na 5. otobra 1711. 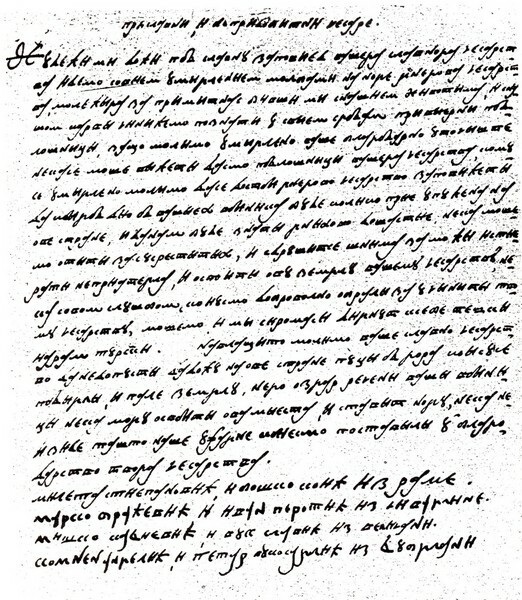 Document written in Croatian Cyrillic in Split in 1711.
according to Slavko Kovačić has been written in the Split archbishopric. 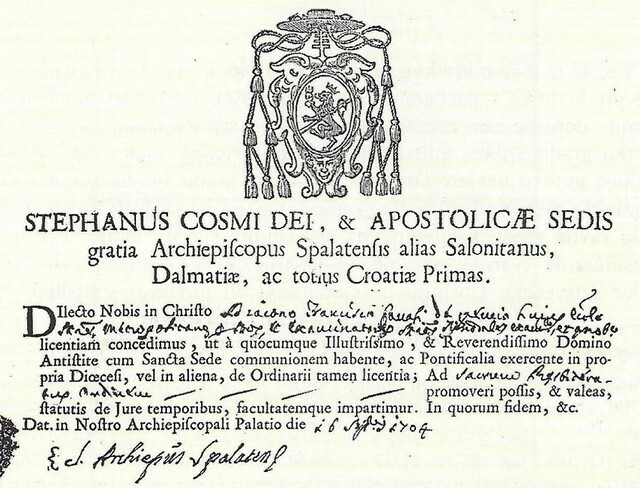 Stephan Cosmi, archbishop of Split, Salona, Dalmatia and primas of the whole of Croatia. 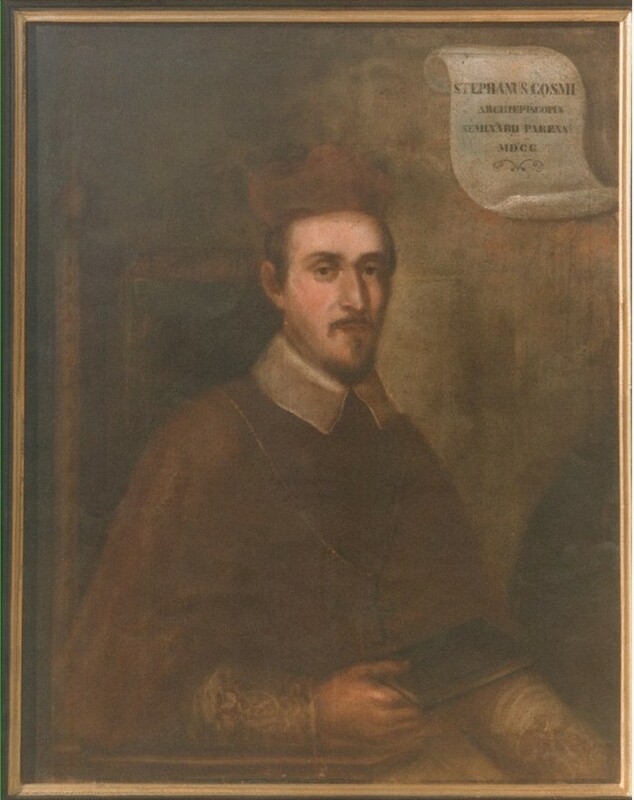 Stephan Cosmi is of Italian origin, and very important figure in preserving the Glagolitic tradition in Croatia. as well as of Solin, ruler of Dalmatia and of the whole Croatian Country. 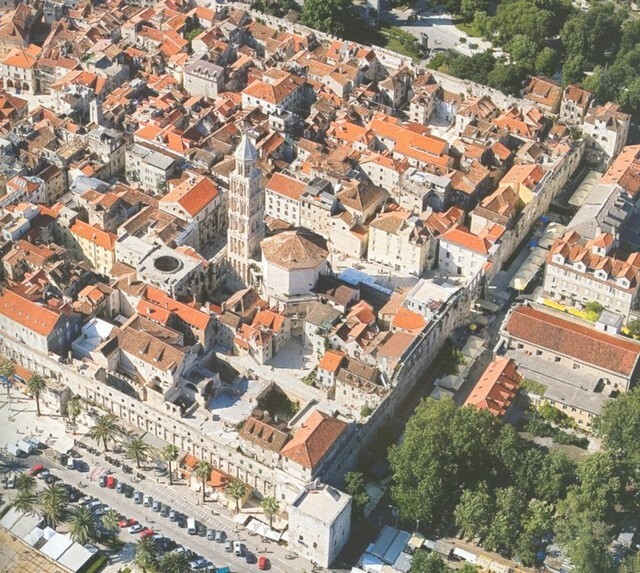 in Split in 1700, the Illyric Academy in 1703, as well as the first City Library. 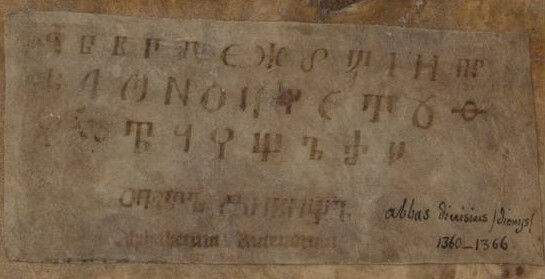 The Topić glagolitic fragment found in the Split Archbishopric, kept in the Old Slavonic Institute in Zagreb. August Šenoa: Seljačka buna, predgovor. Napisao Nenad Hančić, 2015. Ante Škobalj: Obredne gomile, Sveti Križ na Čiovu 1970. Milka Tica: Stećci od Zgošće do Ledinca, naklada Jurčić, Zagreb 2011. Ženidbeni spisi iz arhiva Ninske biskupije: dopisivanje župnika Slivnice i Smiljana (Lika) na hrvatskoj ćirilici (bosanici), Slovo rogovsko, br. 3, Zadar 2015., str. 11-12. Glagoljica i hrvatska ćirilica (bosanica) u Popovićima, Slovo rogovsko br. 4 (2016. 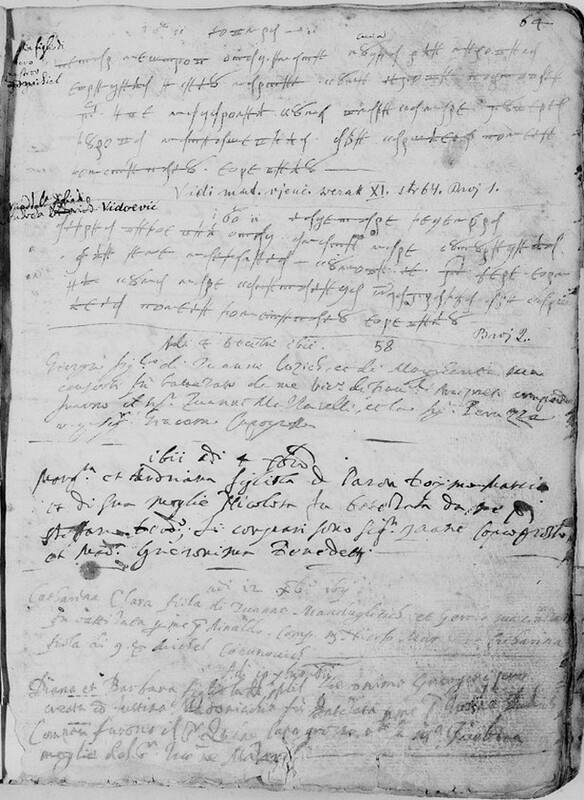 ), 23-26. 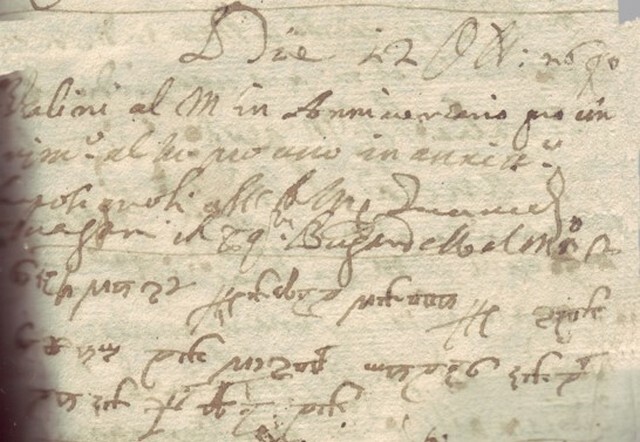 Obavijest o prošćenju podarenom od pape Benedikta Trinestoga pisana hrvatskom ćirilicom (bosanicom) iz godine 1724,, Slovo rogovsko br. 6, Zadar 2018., str. 25-26. --- , Marin Banović i Mihovil Šetka: Hrvatska ćirilica (bosančica) u spisima Šibenske biskupije (2), Slovo rogovsko, br. 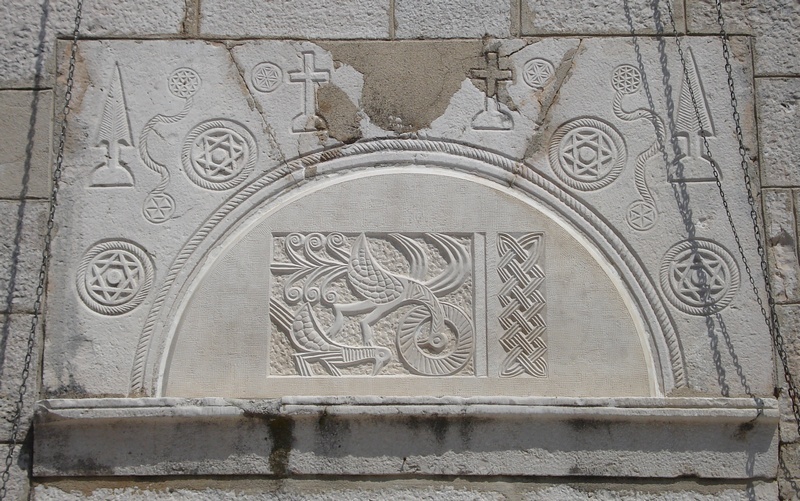 3, Zadar 2015., str. 50-51. 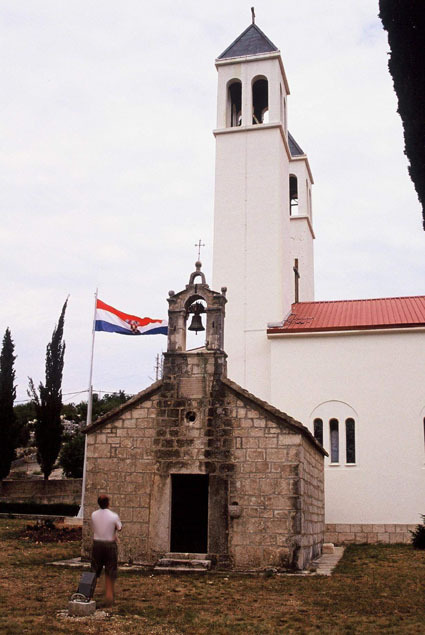 Hrvatska ćirilica (bosanica) u spisima Šibenske biskupije (3), Slovo rogovsko, br. 4 (2016). Hrvatska ćirilica u spisima Šibenske biskupije (4), Slovo rogovsko, 2017., str. 66-67. Hrvatska ćirilica u spisima Šibenske biskupije (5), Slovo rogovsko, 2018., str. 52-54. 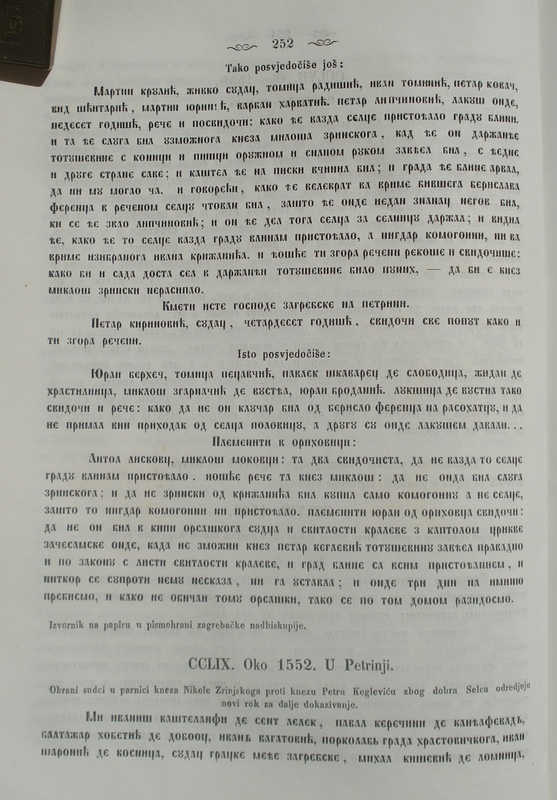 Svjetlana Olegovna Vjalova: Horvatskie kirillicheskie pamjatniki XVI-XIX v. sobranija I. Berčića v Rossijskoj Nacional'noj Biblioteke (Croatian Cyrillic monouments from XVI to XIX c. from the Berčić collection in the Russian National Library), in the Russian, Filologij 63 (2015), 223-243.